Waterstone Cottage - Escape to the Mountains! This property is very unique and offers privacy and great outdoor spaces. It is located close to the Blue Ridge Parkway, Waynesville, and Asheville. There are many hiking trails, rivers, creeks, waterfalls, golf courses, shops, and restaurants. The living area is large and open with a sofa and two side chairs. Some staples left by other guests which we leave for others to use. Typically salt, pepper, olive oil, ketchup, creamer and sugar, etc. Pls inquire if you're interested in anything particular. There is a great picnic shelter with an over-sized fireplace, tables, chairs adjacent to horseshoe pits and the fishing pond. Enjoy coffee on the wonderful rocking chair front porch while listening to the rushing creek across the road. Picnic shelter with outdoor fireplace adjacent to backyard pond. Water stone cottage was a delight! Much more than I expected! Perfect New Year trip with loved ones! We had such a wonderful time at water stone cottage. The cottage was more than expected which was such a great treat! We loved everything about this cottage, the furniture, the layout, downright to the privacy of the bathroom! Such charm, and so cozy! The pictures do not do it justice!! My only complaint is we couldn’t stay longer! Love, love, love it! My companion and I and our friend stayed, we all had plenty of room and privacy and space! We hope to return! Thank you so much! Loved everything about the cabin and location. Sorta remote, but close enough to every thing, Ashville a short drive and plenty of hiking choices. Close to several quaint villages that were fun to discover. Would love to stay there again! Beautiful mountains surrounding the very cozy cottage! Staying at the cottage was an absolute delight! It had a very warm, welcoming feeling, with little accents and touches of home. Was surprised by the mountains surrounding the cottage and how beautiful they were. I had read about the creek across the street, but had no idea how large or beautiful it was. You can hear it as soon as you walk out the door! The outdoor picnic area with the huge fire place was amazing and one of my favorite parts. They supplied an abundance of fire wood for both the inside and outside fire places!! Definitely a place I will go back to again! *It was everything we wanted* Beautiful Piece of Property with a Very Nice Cottage. Great getaway for our family. The house was cozy and had everything we needed. The best part is the yard with outdoor picnic shelter and fireplace. Location ideal for access to Pisgah, DuPont Forest, Blue Ridge Parkway, and Brevard. Creek across the road provides mystical background while sitting in the porch at night. Owner sent plenty of information and was quick to respond. If you’re looking for a cabin to unwind and rest your head after a day of exploring this is a great place. 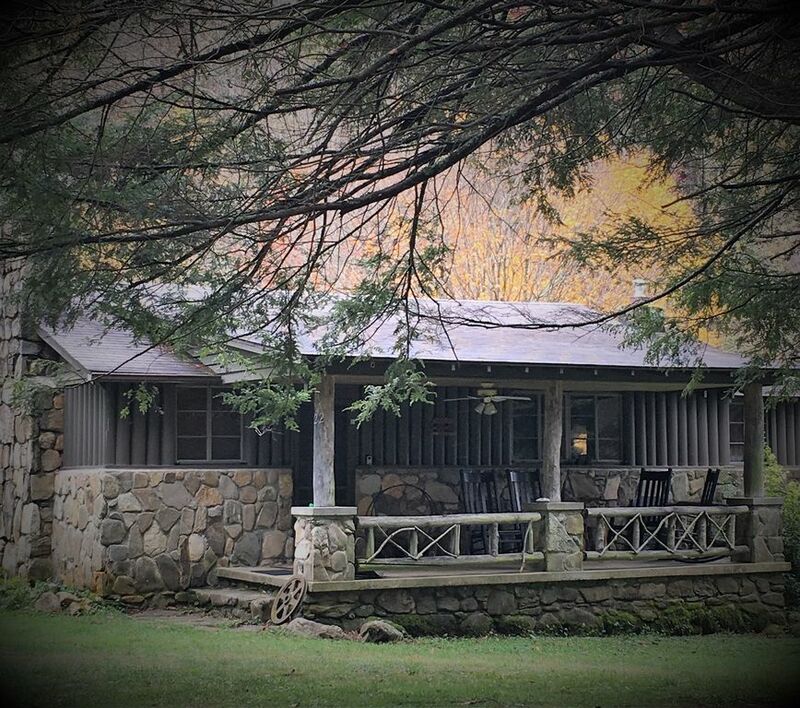 Fishing in private backyard pond and stream requires no fishing license, horseshoe pits adjacent to picnic shelter with large fireplace on property, spectacular golf course only 3 miles north on US 276.